Washington has presented “no evidence whatsoever” yet that the Shayrat airfield in Syria’s Homs Province targeted by the US after an alleged chemical attack in Idlib had any such weapons, the Russian Defense Ministry said. “Twenty-four hours have passed since the US Navy warships launched a massive missile strike at the Shayrat airfield, and neither the Pentagon nor the State Department have provided any evidence of presence of chemical weapons at this airbase,” the ministry spokesman, Major-General Igor Konashenkov, said in a statement on Saturday. 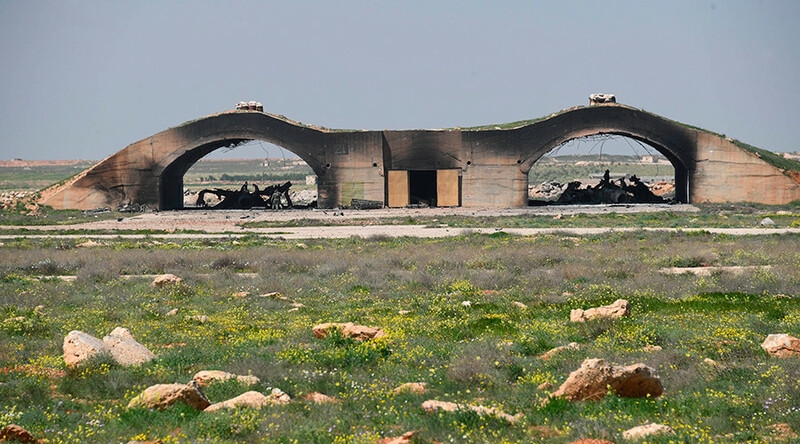 Dozens of representatives of the media, local authorities, fire departments, police, and the Syrian military have visited the airfield since then, with no alleged “storage units” or any chemical shells having been found, he said. “The only way to receive and present to the whole international community any objective evidence on the alleged presence of poisonous substances at Shayrat is to send a mission of professional experts there,” the defense ministry statement said. All the people who have worked at or visited the airfield “do not wear gas masks and are feeling pretty normal,” Konashenkov said, adding that “any specialist from the Organization for the Prohibition of Chemical Weapons (OPCW) knows that traces of chemical agents cannot be hidden for months and years” if they were stored somewhere. “So here comes the question: what and by who has yet again been presented to the new US president as ‘proof’ of existence of chemical weapons in the state which is out of Washington’s favor?” the military official said, reminding of then-US Secretary of State Colin Powell’s white powder vial at the UN and other allegations of the chemical weapons “threat” in Iraq. Special equipment to collect samples for further scientific analysis should be used at the airfield, the defense ministry said, adding that Russia has already undertaken similar procedures in Aleppo, Syria where it said chemical weapons had been used by militants. Early Friday morning, the US launched 59 Tomahawk missiles at the airfield, ordered by US President Donald Trump in response to the alleged chemical attack in Syria’s Idlib Province. Dozens of civilians including children died from suspected gas poisoning in the rebel-occupied territory earlier this month, with Washington blaming the Syrian government for the incident. Calling its attack on the airbase a “targeted military strike,” Trump claimed the airfield in Homs was where the alleged chemical gas attack originated. “There can be no dispute that Syria used banned chemical weapons, violated its obligations under the chemical weapons convention,” Trump said. Russia condemned the US missile strike in Syria, saying that Washington’s move showed it feared “a real investigation” into the alleged chemical attack. Speaking at a special UN Security Council meeting on Friday, Russia’s acting deputy envoy to the UN, Vladimir Safronkov, said the Syrian government was not in control of the area of Idlib Province where the alleged attack happened. The US is “afraid” of a real, genuine investigation into the incident, which might have proven Washington wrong in blaming the Assad government for the alleged use of chemical weapons, the Russian diplomat added. The principle that one is considered innocent unless proven guilty had also been ignored, he added.